Over 2,000 Greek islands are scattered about the eastern Mediterranean, roughly 200 of them inhabited. 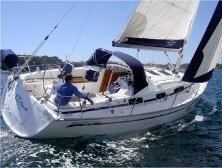 Image what you can discover sailing it! The 2000 islands of the Greek archipelago share much common history and culture, but each has its own individual character. 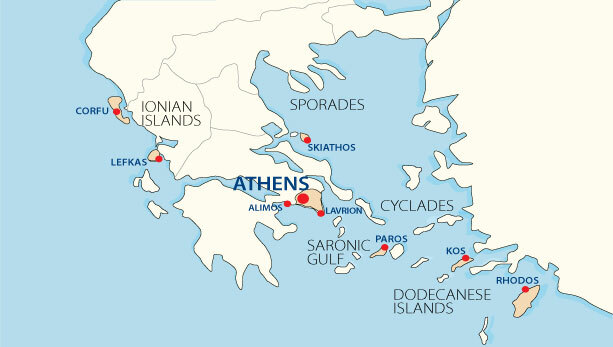 To the east of the mainland, lie the northern Aegean islands and the Sporades. 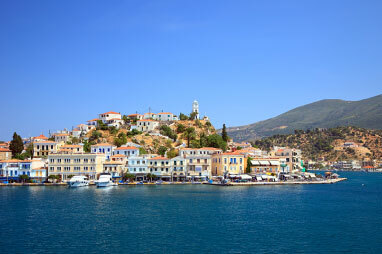 Further south, are the Dodecanese and Crete (Kriti), the fifth largest island in the Mediterranean. The rocky Cyclades gave birth to ancient Cycladic civilization while the islands of the Saronic Gulf have a great seafaring tradition. To the west, lie the Ionian Islands, also known as the Heptanisa (seven islands) or the islands of the Ionian Sea. For the sailing destination SARONIC & ARGOLIC GULF and the PELOPONESE COAST, EASY SAILING operates departures and returns for yacht charters from its charter bases in Alimos marina and from Lavrion base -both in Athens. 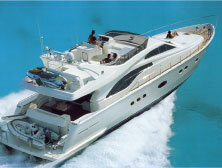 Athens can be reached very easily, and there is a number of ways to reach Alimos marina or reach Lavrion base in Athens. The Saronic and the Peloponese area is a nice & calm sailing place with a wide variety of landscapes, small distances between the islands, sandy or pebbled beaches and both touristy and secluded ports and anchorages. In all the bigger islands in the region (such as Aegina, Aghistri, Poros, Hydra and Spetses) and in other known mainland approaches (like Epidavros, Methana, Ermioni, Porto-Heli, Nafplio and Monemvassia) there is much to explore and apart from the charming crowded capitals there are equally beautiful and rather un-spoilt spots one can check. Some of the places around the Saronic Gulf and the Peloponese have mountainous terrain and others not, but most of them have dense vegetation and altogether form their own, special and truly original ?character? 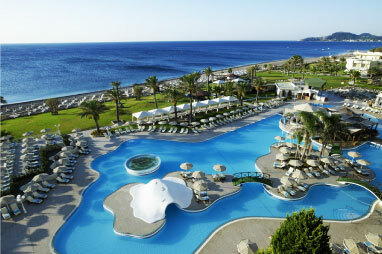 which is easily distinguished from any other place in Greece. When people say that they 'd love to sail the Greek islands or when they hear about Greek islands sailing, they mean and understand sailing the Cyclades islands. 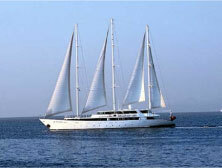 Talking about sailing holidays in the Greek islands, we should take a good look at the winds of the area. The prevailing wind in the summer is the one coming from North and is well known as the Meltemi "Meltemi". It begins to blow in mid June, gets strongest in July and most in August and fades out by the begining of September. In July and August the wind blows at force 5-6 and may reach force 7-8. It may blow for 1-3 days or sometimes blow for 4-5 days in a row. During the rest of the months of the year the wind force is less (around force 3-4 Beaufort scale). 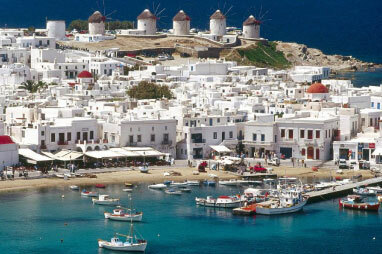 TIP: In the Northern Cyclades (islands of Andros, Tinos, Mykonos, Kea, Syros etc.) it blows from North East. In the Middle Cyclades (islands of Paros, Naxos, Kthnos, Serifos, Donousa, Amorgos etc.) from the North. In the Southern Cyclades (islands of Ios, Milos, Sifnos, Sikinos, Santorini, etc.) it blows from the North West. In the South West Cycladic islands (Sifnos, Milos, Folegandros islands) it is significantly less strong. 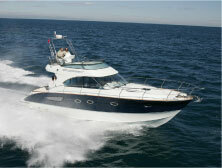 The wind and sailing conditions in the Ionian Sea are ideal and predictable. From May to September the wind blows from North-West at Force 2-5 arriving around noon, and calming down before sunset. In the morning it is also noticed that a light Easterly wind may blow at a force of 1-2. During the months of July and August, the above said winds can blow a little stronger than usual. The weather conditions in the area are extremely favorable for a relaxing and trouble-free sailing turning the area to a highly recommended place for family and smooth sailing in July and August - a time that winds in other regions in Greece are strong and sometimes uncomfortable. The Ionian Islands located on the western side of mainland Greece, are seven main islands (in Greek Eptanissa - seven islands) that distinguish from many of the Greek islands by their fertile land (blanketed with olive groves and cypress trees sustained by the winter rains) and clear blue waters. The mixture of different civilizations and cultures is harmoniously welded together into one piece that is undoubtedly Greek, in a complex of islands where the most beautiful beaches of the Mediterranean can be explored. The Dodecanese Islands lie to the east of the Cyclades off the coast of Turkey. 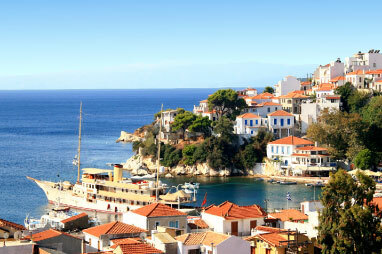 The Dodecanese are said to be a sailor?s paradise of more than 163 islands and islets. There are uncounted beautiful beaches and bays that one should not miss on each island. The charter points to begin the sailing trip and schedule the Dodecanese route are from our sailing charter base in Rhodos island (Mandraki Marina), Samos island (Pythagoreio New Marina), or Kos island (Kos marina). All bases are located near international airports of the respective islands. In the summer months (June to September inclusive), the prevailing wind is the "Meltemi" coming from the NW-W like in the Cyclades islands and the open Aegean Sea. It begins to blow in mid June, powers-up from end July to early September and weakens off in October. The usual force of the North winds is 4-6 in Beaufort scale and may on occasion reach force 7 or more rarely 8. It does not blow every day, but may do so without break for 3 to 4 days and less times 5-6 days. The typical and common description all yachtsmen give for the area is: "Sailing the Sporades is all about anchoring in a bay at one side of a sandy or rocky beach letting the pine trees provide adequate shade to the boat and her crew". 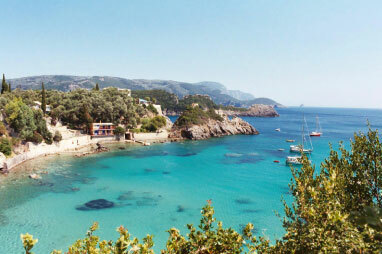 Although Skiathos is one of the most popular holiday destinations in central/northern Greece with the most famous beaches, the other three bigger islands of the Sporades Group (Skopelos, Alonissos and Skyros) are equally beautiful and rather unspoilt. All of them consist of mountainous terrain, have dense vegetation and altogether have established their own, special original character different from any other place in Greece. There are numerous beaches in the area and many of them are accessible only by boat. They are found not only in the bigger and smaller islands, but in the North coast of Evia as well and inside the Pagassitikos Gulf (Volos) and the East coast of Thessaly mainland. Another must-see spot is the MARINE PARK of the seal Monachus-Monachusjust wherethe minor islands (Piperi, Kyra-Panagia, Yioura, Peristera, Psathoura, Skyropoula, Skantzoura) are situated NW of the main Sporades.